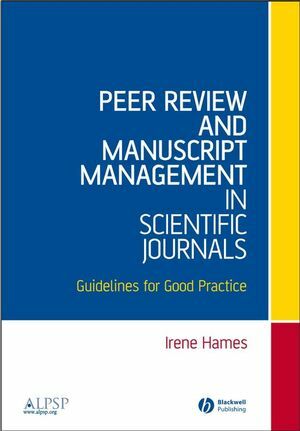 This comprehensive yet concise book provides a thorough and complete guide to every aspect of managing the peer review process for scientific journals. Until now, little information has been readily available on how this important facet of the journal publishing process should be conducted properly. Peer Review and Manuscript Management in Scientific Journals fills this gap and provides clear guidance on all aspects of peer review, from manuscript submission to final decision. Peer Review and Manuscript Management in Scientific Journals is an essential reference for science journal editors, editorial office staff and publishers. It is an invaluable handbook for the set-up of new Editorial Offices, as well as a useful reference for well-established journals which may need guidance on a particular situation, or may want to review their current practices. Although intended primarily for journals in science, much of its content will be relevant to other scholarly areas. ALPSP members are entitled to a 30% discount on this book. Irene Hames moved from cell biology research into scientific publishing and worked for many years on scholarly journals. She was the founding managing editor of a large international science journal for 20 years, running the editorial office and managing the peer-review process. She now works as an independent editorial consultant. She is frequently called upon to give talks and advise on editorial issues and has been a member of a number of working parties on peer review. What should peer review do?. What does peer review assume?. What is this book trying to achieve?. 2. The peer-review process – how to get going. The people involved in running the peer-review process. Choice of system and procedures. 3. Manuscript submission and initial checks on completeness and suitability. Checking and logging of submitted manuscripts. Initial assessment of suitability and rejection without external review. 4. The full review process. Identifying and selecting appropriate reviewers. Getting the manuscript and associated material to the reviewers. Receiving and checking of returned reviews. Dealing with enquiries on manuscript status. 5. The decision-making process for reviewed manuscripts. The organizational structure for decision making. Checks to be made before communicating decisions to authors. Communicating the decision to the authors. Rebuttals and appeals from authors. Decision making to consistent standards and the problem of availability of space. Special considerations in decision making: dual-use research and the possible misuse of information. 6. Moving to online submission and review. How do you choose an online system?. How to prepare to move to online working. The launch and transition period. What to expect after going live online. Problems that may be encountered and how to deal with them. 7. Reviewers – a precious resource. Thanks and feedback to reviewers. How to develop and maintain reviewer loyalty. Recognition of peer review as an accredited professional activity. 8. The obligations and responsibilities of the people involved in peer review. Authors – their obligations and responsibilities. Editors – their obligations and responsibilities. Reviewers – their obligations and responsibilities. Editorial office staff – their obligations and responsibilities. Conflicts of interest – what they are and how to deal with them. 9. Misconduct in scientific research and publishing – what it is and how to deal with it. What types of misconduct can occur?. How should cases of alleged or suspected misconduct be handled?. Where can you turn for help?. What sanctions can be imposed as a penalty for misconduct?. Dubious or fraudulent data remaining in the literature. Appendix I The Golden Rules and the Peer-Review Good Practice Checklist. Appendix II Examples of checklists, forms, guidance for reviewers and editorial letters. Appendix IV Alternative models of peer review. "…a godsend to the rookie editor taking the driving seat for the first time and feeling understandably daunted by the responsibility. Statements like 'no editorial office should be without it', 'an essential resource' or 'indispensable' unfortunately sound like clichés. In the case of this book, however, they are all true. In fact, I think I will need a second copy for when one of my colleagues pinches this one!" (Learned Publishing).